I went down to Agua Fria Nursery and got some lettuce and chard starts back in mid-November intending to plant them right away. I waited too long to transplant them and they got stunted and crowded in each cell as shown above. When I did transplant them I teased them apart and planted them in small pots. Here they are right after I transplanted them on December 1. ‘BT’, the man of the house, inspects them. 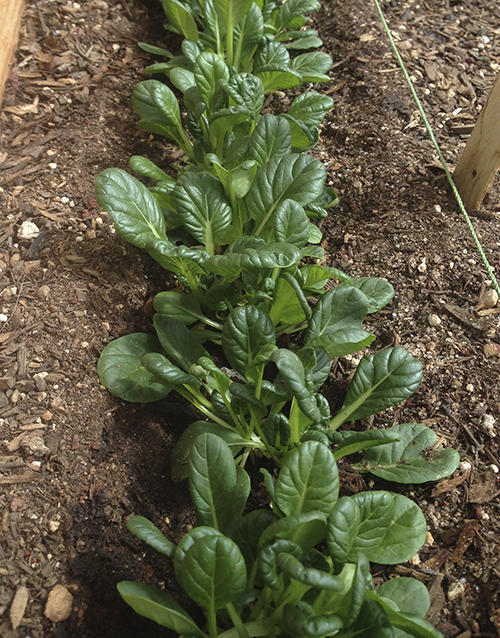 Here are the Chard transplants on Dec 14-only 14 days later! Look at the difference between the two pictures. I’ve grown all the lettuce and chard transplants under my lights in the house as it is too frigid to put them in the greenhouse now. I figured I could wait till after the Persephone period was over and by then they would be just big enough to transplant in the GH. 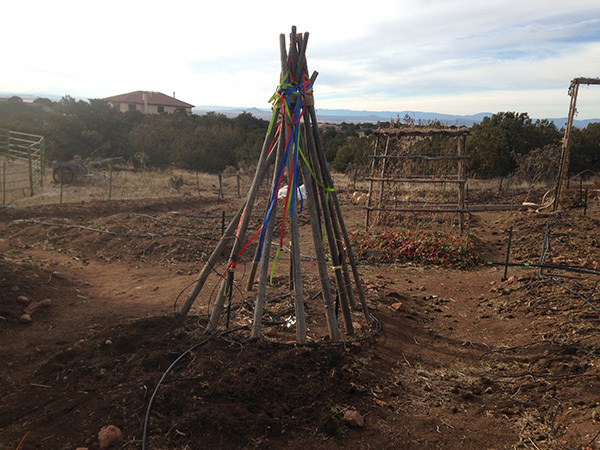 The Persephone period will be over on January 15th here in Santa Fe when the daylight hours get longer again. The plants will be ready to transplant way before that time period. The chards are coming along nicely. 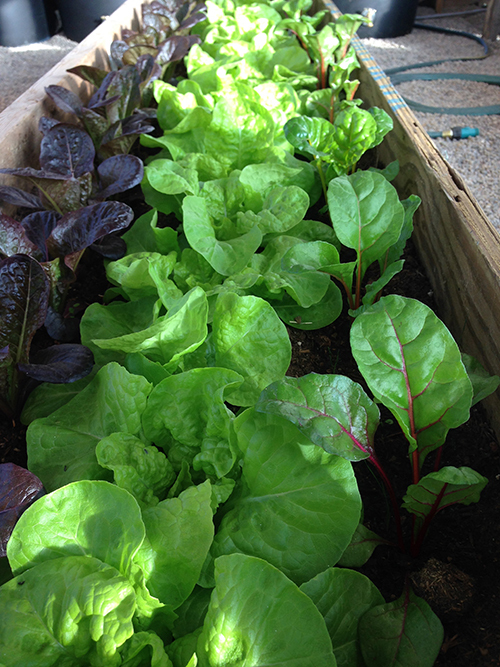 I’m growing ‘Argentata’ chard and ‘Ruby Red’ chard. 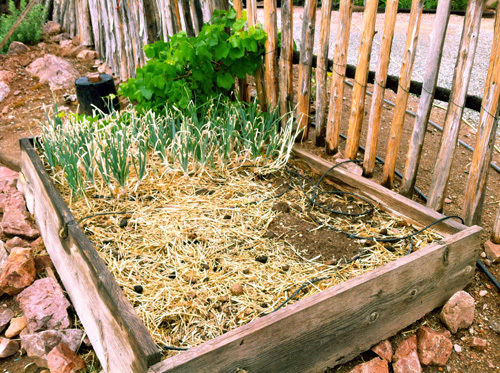 I planted them in a new potting soil called Batch 64-‘Moonshine’ which is available at Agua Fria Nursery in town. It’s fantastic with everything growing very fast. 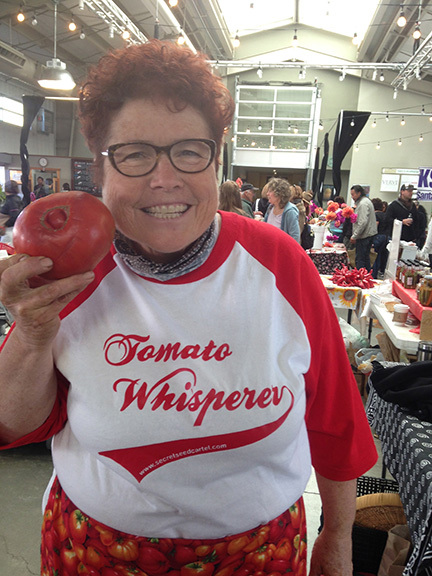 When I went back to Agua Fria Nursery and talked to Bob, he said he had the same experience last year, especially with the tomatoes. 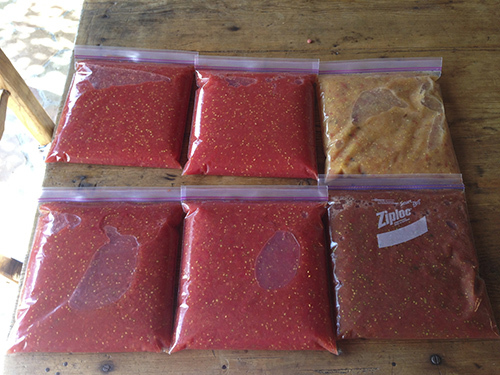 Here are the ingredients in it: coconut coir, perlite, pumice, rice hulls, expanded shale, humus, worm castings, biochar, feather meal, fishbone meal, blood meal, alfalfa meal, oyster shell, metamorphosed evaporite, flaxseed meal, cotton seed meal, dried molasses, kelp meal, azomite, potassium sulfate, limestone, yucca extract, and mycorrhizae. Phew-quite a list! 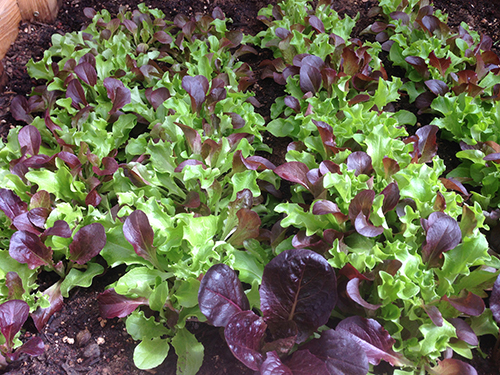 The lettuces planted on Dec 1 are ready to transplant now! They have absolutely gone crazy growing super fast in this potting soil. 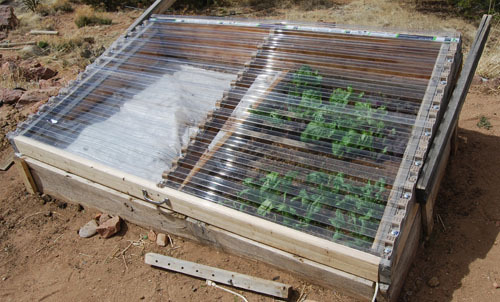 The varieties I’m growing are North Pole, Winter Wunder and Marshall Red Romaine. Holy Schmole! 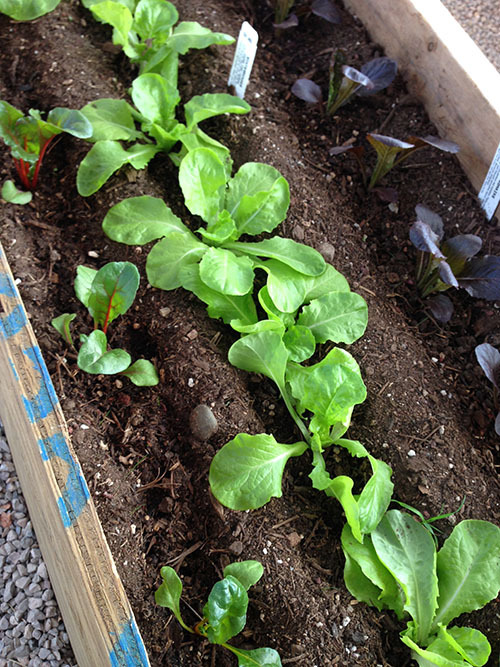 My lettuce, in the picture above was planted as transplants back on February 17th and look at it at the end of March. Fantastic! So excited to not have to buy lettuce and greens for a while. 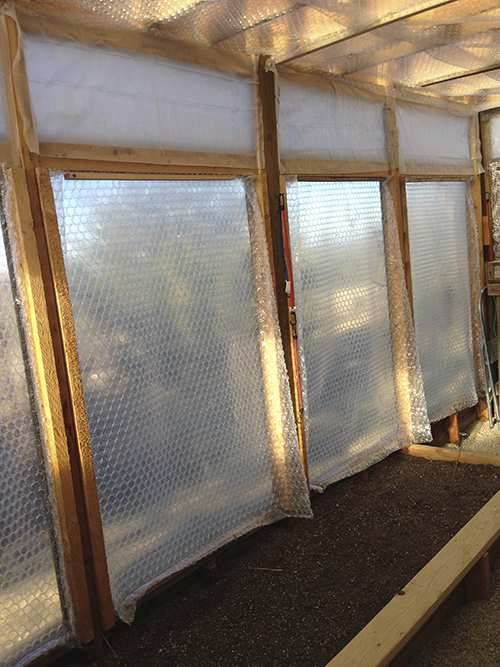 I’ve been experimenting in the greenhouse planting some seeds and some as transplants. I got these transplants as little tiny plants in pony packs from Agua Fria Nursery in town in February. On the left is Marshall Red Romaine. 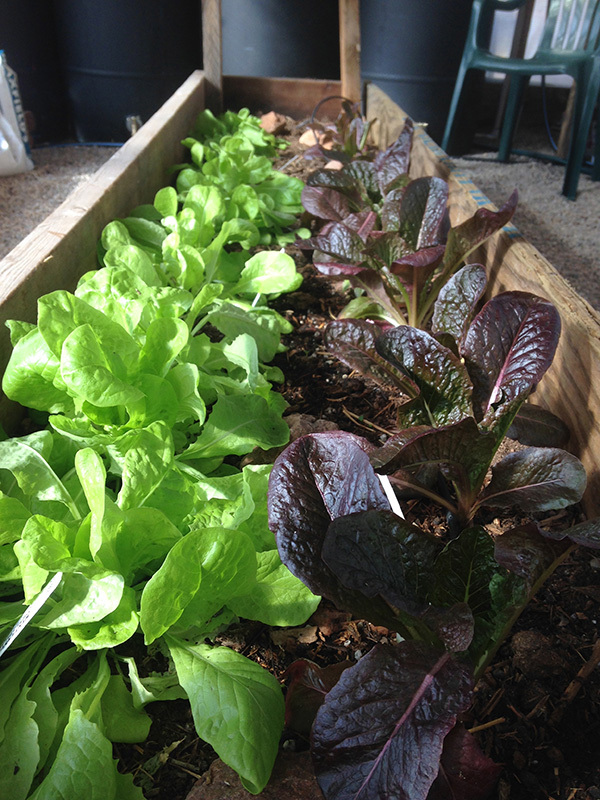 In the middle is ‘Winter Wunderland’ leaf lettuce and on the right is Bright Lights Chard. They are growing in the middle raised bed where I had horse manure composting in January to try to add heat to the greenhouse but in mid February I took out as it cooled down and took all but the top 6 inches and added soil and compost and waa lah! You can see how big they got since March 21 here. 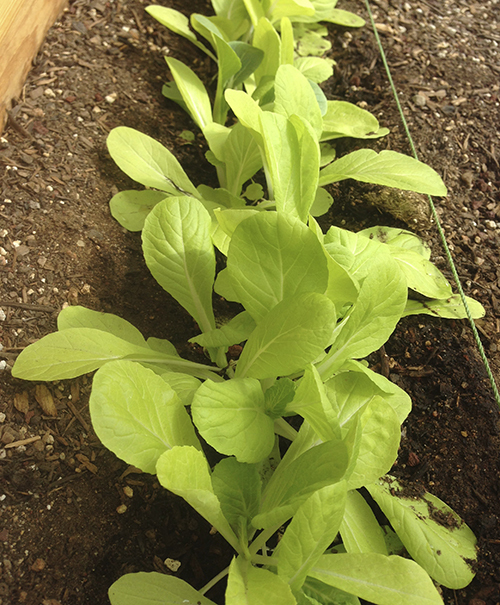 Here is a pic of the lettuce I planted by seeds. It is a mesclun mix from Johnny’s called, 5-star lettuce mix. It’s not quite tall enough to ‘cut and come again’ but will be soon-probably in the next week. 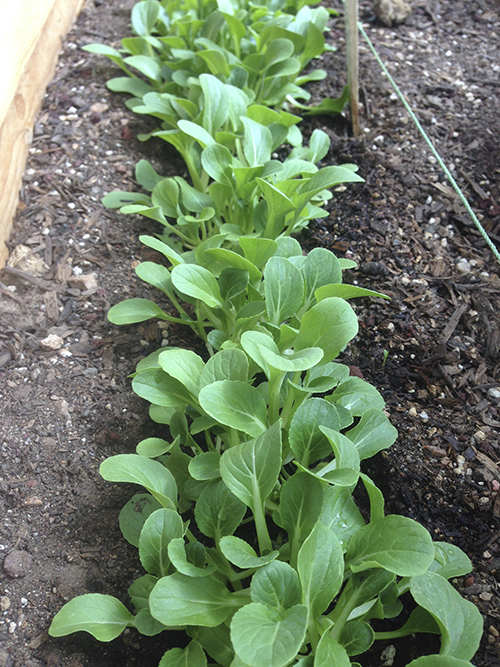 Here is a variety of dwarf bok choy (choi) I planted from seed. 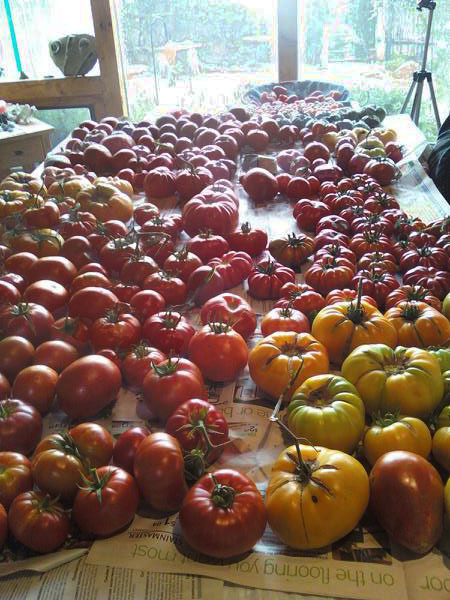 I will transplant some of these to sell a little later and the rest will have room to really get bigger. They are doing really well. I love the color of this yellow-green bok choi – chartreuse! Such a great contrast to the other ‘greens’. 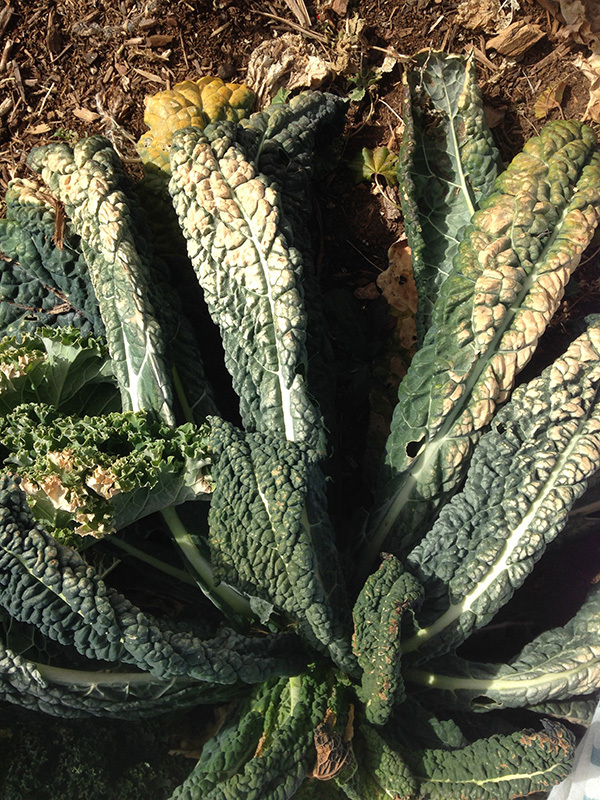 Here is a variety called tatsoi-the hardiest of the bok choi family. It grows in little clusters. 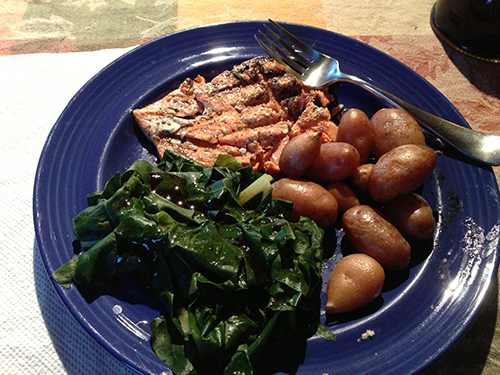 Argentata Chard is not only delicious but cold hardy too. 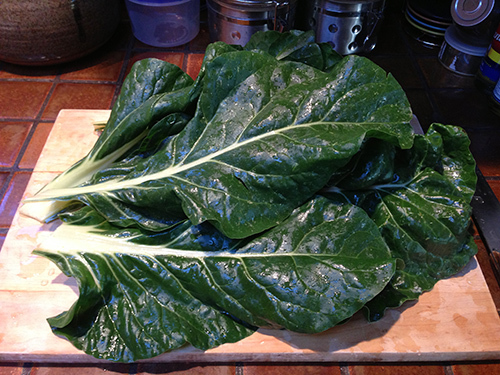 This past year I grew several varieties of chard—Ruby, Bright Lights and Argentata (shown above). 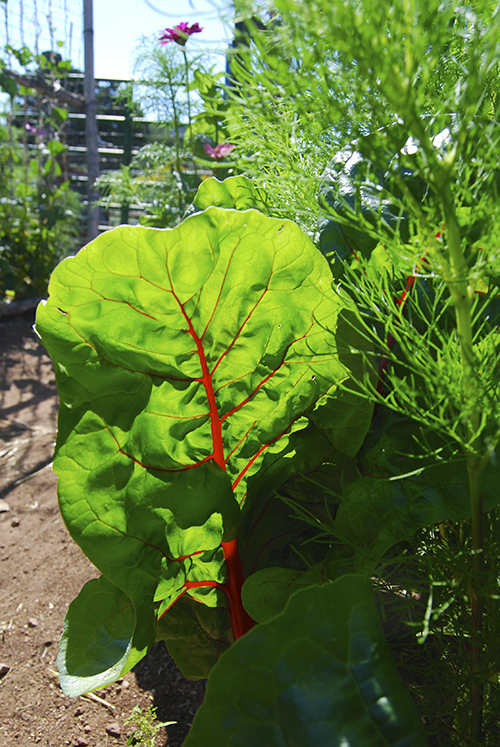 For looks in the garden I would pick Ruby chard and Bright Lights (whose stalks come in lovely shades of red, pink, salmon and yellow) and grow them around my flowers inside my vegetable garden because they are soo beautiful (Ruby chard-above last year). But to eat and for flavor I would pick Argentata chard hands down. This heirloom chard, also known as Bionda da Costa, is revered by Italian cooks and for good reason. 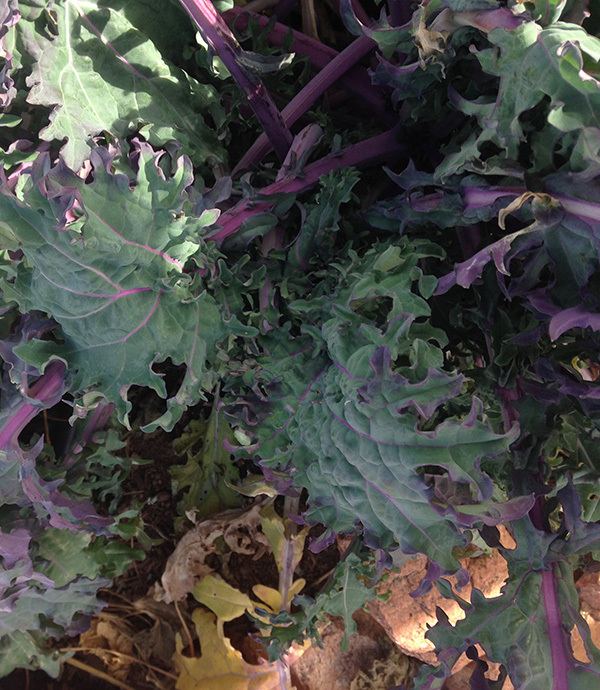 Argentata produces large, deep green leaves with juicy white stalks. The stalks are never stringy or tough like some other chards but soft and tender when steamed. I eat both the leaves and stems. 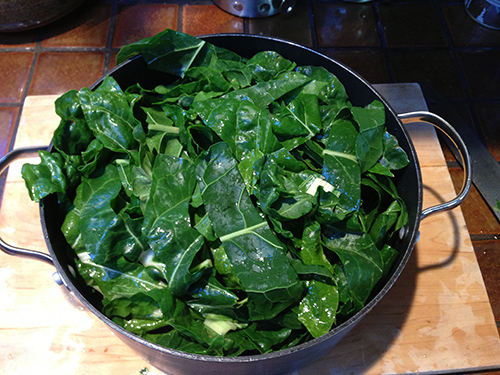 Chard reminds me of steamed spinach only better. And a bonus of Argentata is that it is one of the most cold hardy varieties. It won’t make it through the whole winter here in Santa Fe but will survive longer in the fall than the others with our cold winters. 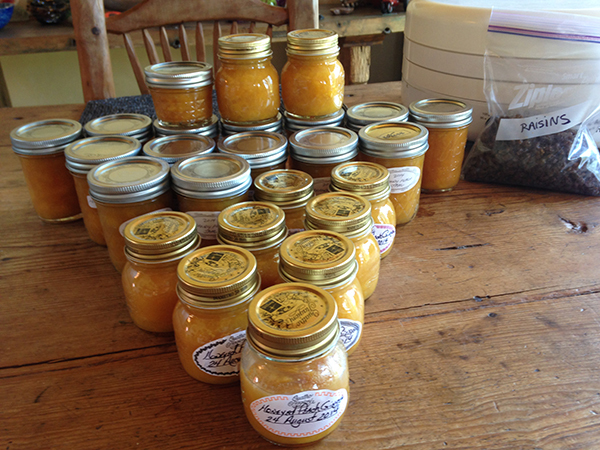 I got my seeds from John Scheppers Kitchen Garden Seeds. 🙂 We can plant chard seeds inside right now in March and early April and transplant them to the garden in late-April or plants seeds then too but not now as it is still too cold at night.